ASHREENA PILLAI pays a visit to one of the most beautiful Buddhist temples in Malaysia, situated in Petaling Jaya. Petaling Jaya, Malaysia -- My visit to the Thai Buddhist Chetawan Temple in Petaling Jaya was an unforgettable experience indeed. Though I have seen documentaries on Thailand, visiting a Buddhist temple right here in Kuala Lumpur was absolutely wonderful. It felt as though I had been transported to Thailand. I entered the premises with caution because I was unsure about the etiquette practised by the monks. Meeting Chief Monk Phra Kru Sophitchariyaphorn in his office, I was taken aback at how warm and welcoming the monks are. Taking the LRT to work every day, I am always fazed by the rush and coolness of city folk. But the monk made me feel relaxed with his simple ways and gentle humour. I guess holy places have their mysterious ways of making you feel welcome. It reminded me of the time when I visited the Cathedral of the Holy Immaculate Conception in Johor Baru in 2004 for Ash Wednesday. I loved the peaceful, serene feeling I experienced there. It was the same serene calm here. The architecture was lovely. Though I am no art aficionado, it is easy to appreciate beautiful things and just like the churches and Hindu temples, the architecture at Chetawan Temple was beautiful. Buddha-inspired paintings and Thai details echoed in every area. The temple opened in 1957. King Bhumibol Adulyadej of Thailand also gave his full support for the venture. The king also performed the ceremony of raising the main chor fah of the temple which is vital in the building of a temple. “The Thai king also brought a statue of Buddha named Luang Pho Putthak Thammin from his Royal palace and donated it to the temple,” the Chief Monk said. The temple has many beautiful areas such as the Bot (main temple), Chedi (which enshrines relics of Buddha and holy men), Vihara (a replica of the Bot used to keep Buddha images), Mondop (enshrines a holy object like a statue of Brahma), Sala (resting place), Kuti (living quarters) and Hok Rakhang (Belfry). My favourite feature would definitely be the Bot. It features Buddha moulded in stucco sitting high on a gold-flexed pedestal decorated with glass mosaics. 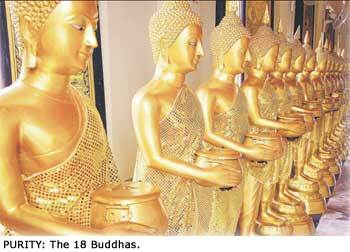 I also adore the row of 18 Buddha statues holding alm pots, the designs on the ceiling, and drawings on the windows. 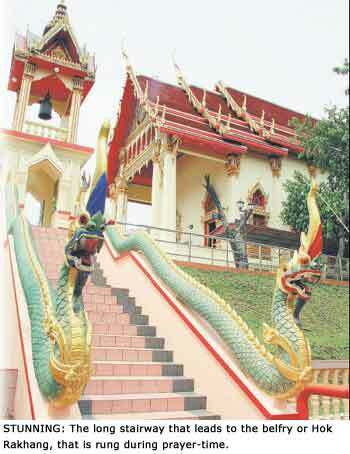 My other favourite is the Naga (mystical serpent) that acts as the railing for the steps that lead to the belfry. 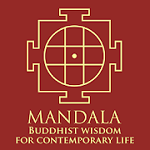 The paintings of Buddha’s teachings in the Vihara and Chedi are also inspiring. Like every other place of worship, the temple has a busy calendar full of auspicious festive days from January to December, among them Magha Puja Day, Chap Goh Mei, Cheng Beng Day, Wesak Puja Day, Rains Retreat (Phansa), Kathina, Loy Krathong Festival and more. 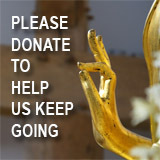 The Thai Buddhist Chetawan Temple is at No 24, Jalan Pantai, 46000 Petaling Jaya, Selangor. Tel: 03-7957-2255.